Launched in 2012, the SSA Griffith Edwards Academic Fellowship scheme is available to current Society members and has been established to support academic career development (for both clinical and non-clinical academics) in areas of addictions study which further the declared aims of the SSA. The SSA is committed to getting good quality evidence into clinical practice and policy making in the addictions field, and an important way of doing this is by investing funds to help build career pathways in addictions research. For many years the society has financially supported individuals to undertake undergraduate and masters degrees, and more recently added a fully funded PhD studentship programme. In 2012 the executive committee decided to invest in creating a yearly post-doctoral Fellowship position, and six SSA Academic Fellows have now been supported. The SSA Griffith Edwards Academic Fellowship scheme, named after a former editor of the Society's journal, aims to provide opportunities for high-calibre post-doctoral Addictions academics (either clinical or non-clinical) to pursue higher-level training in addiction science in an appropriate department within a UK university. The exact area of addiction science is not specified, but the SSA expects that their proposed body of study should be relevant to the aims of the Society. The standard duration of the Fellowship (and the associated funding support) is three years, although we permit the period to be longer if the Fellow needs or chooses to utilize the Fellowship on a part-time or interrupted basis e.g. around maternity leave or return to work part-time. Watch Prof Sir John Strang in conversation with Jamie Brown and Caitlin Notley about the impact that being awarded an SSA Fellowship made on their research and career development. 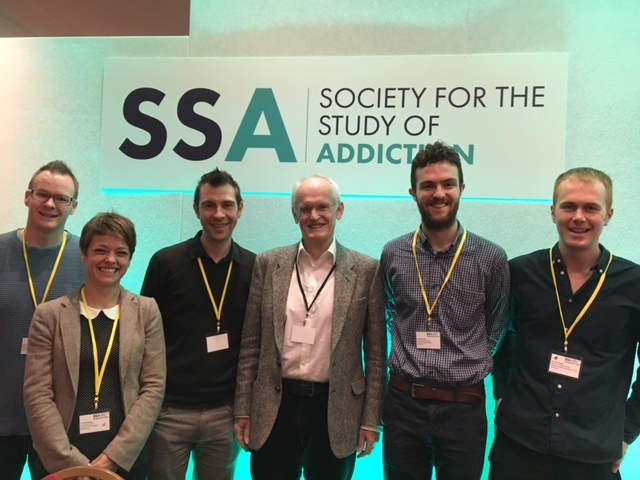 A first formal meeting of the Fellows was arranged at the SSA Annual Symposium in York on 10th November 2016 (see picture: from left to right Paul Toner, Caitlin Notley, Felix Naughton, John Strang, Jamie Brown, Tom Freeman). This provided an opportunity for the past and present award holders to share their research experiences, and to discuss their experience of being an SSA Fellow with members of the executive group. The group was particularly pleased to hear that the Fellowship had enabled Felix Naughton to secure a tenured academic position (as he describes here). A number of useful ideas were raised as to how the Fellows could further enhance the work of the Society, and it was agreed that one of the group should attend SSA Trustees meetings as an observer. The Fellows were invited to become involved in the planning and delivery of the annual PhD meeting (which is now being moved to be on the day before the SSA Annual Conference) and to explore the potential for providing mentoring for the SSA PhD students. The scheme has been a great success so far, and consideration is being given to expanding the number of awards in future. Details of how to apply can be found below. This document comprises: (A) the overall purpose of the SSA academic fellowship scheme and, (B) processes and procedures. The SSA academic fellowship scheme has been established to provide opportunities for high-calibre post-doctoral addictions academics (either clinical or non-clinical) to pursue post-doctoral career development in addiction science in a UK university or UK university affiliated NHS clinical setting and which will, in the opinion of the trustees, further the aims of the SSA. At this stage, the Society plans the appointment of one academic fellowship position per year, with the duration of support being three years. The appointment will be known as an SSA academic fellow (considered as an applicant who will, during the course of the fellowship, become suitable for appointment to lecturer level). Applications will be considered once per year, with the panel making one appointment per year. Hence, once the scheme is in place, there will be a maximum of three academic fellows supported at any time. All appointed academic fellows will be expected to attend SSA events regularly (e.g. annual meetings) and be available to present poster or oral presentations on progress with their body of study. No restrictions are placed on the precise area of addictions study forming the basis for academic fellowship, except that it must address areas which support the aims of the SSA. applicants must be current members or student associates of the SSA. applicants must be resident in the UK. applications must always be for employment and supervision by a UK University for the fellowship component of the applicant's appointment (they may also have a separate part-time appointment in a clinical service where research studies may be carried out in a clinical NHS setting). an applicant wishing to be considered on the clinical academic fellowship track will be expected to secure partial funding support for continued clinical activity and further clinical training, with the level of SSA support reduced to a part-time component, equivalent in value to the non-clinical academic track. employees of the alcohol, tobacco and gambling industries are not eligible for the scheme. applicants for an academic fellowship must describe in advance the area of academic development and the anticipated academic product and how it will support the aims of the Society as well as meeting university criteria for academic excellence. applicants will be expected already to hold a higher degree (e.g. PhD) in an area of study of direct relevance to the addictions field. academic fellows are required to report to the executive council on the progress and the outcome of their higher addictions academic work, and in accordance with the attached role description. in the event that an academic fellow’s focus of study changes, so that it no longer has a clear addictions basis, funding by the SSA will cease. the successful candidate must declare the SSA’s support clearly, and will be expected to describe themselves as an SSA academic fellow. Applications must be submitted simultaneously online or by e-mail, and hard copy. Applicants must submit the completed application form, providing a portfolio of proposed work, which will form the basis of the proposed academic fellowship studies. Successful applicants are expected to describe their appointments as being SSA academic fellowships, and may refer to themselves as SSA academic fellows. The deadline for applications was 8 March, 2019. A panel will be convened from the SSA Board of Trustees (who may, at their discretion, invite involvement of other independent appropriate senior addictions academics to assist in part or all of the short-listing, interview and appointment process). Members of the panel who have a pre-existing and current professional relationship with one of the applicants, or whose institution would gain in any way from the acceptance of the candidate’s application will stand down from the assessment and appointment process. Panel interviews will take place on 23 May, 2019. The process will involve the gathering of references and independent academic opinions, and the direct interview of short-listed applicants. The SSA aims to provide a decision on applications within four months of the submission deadline. Applications should be submitted to the SSA executive office. The short-listing and assessment process will be managed by the SSA with support where appropriate from independent university personnel, if the SSA wishes. If, on preliminary screening, an applicant’s proposal is considered potentially appropriate, it will be sent for independent refereeing and references will be gathered. The final recommendation will rest with the executive council, guided by the advice of the responsible executive council members, the referees’ reports, and the findings at interview. Funding support will be provided for a maximum of three years for full-time higher academic post-doctoral study (or proportionately longer in the case of part-time study, up to a maximum of five years). A submission deadline will be announced by the SSA each year. At the immediately preceding executive council meeting, any changes to the selection criteria or procedures will be considered for approval by the Board of Trustees. All applications must be submitted online or by email by the published date, with a hard copy following within a week by post. A date will be agreed by the sub-group of the Board of Trustees for short-listing, interview and decision, and for notification of success/failure to the applicant(s). Applications will be sent to the SSA’s executive office where they will be checked to ensure that the necessary required information has been supplied. Applications will then be sent for short-listing by the identified executive council members who comprise the academic fellowship panel. The executive office will secure references from appropriate independent external referees for each short-listed applicant, and will also secure independent review of the application (preferably with the same reviewer considering each application, if appropriate and possible). The academic fellowship panel will be appointed by the Board of Trustees. Short-listed applicants will be interviewed, and their recommendation will be based on assessment of (i) the individual applicant, (ii) the qualities of the declared host institution and supervisor, and (iii) the proposed body of addictions academic study, alongside consideration of comments from reviewers and referees. The academic fellowship panel will make its recommendation to the Trustees which will have the power to approve or reject the panel’s recommendation. Summary data will be sent of the recommended candidate with full information on what further university appointment process should be followed. In exceptional circumstances the Trustees could seek additional information from the recommended applicant, before accepting the recommendation. These criteria are based on three areas: the candidate; the proposed host institution; and the proposed body of addictions academic study. The panel will score each application in each of these areas. The academic fellowship selection panel and the Board of Trustees will consider the potential and the trajectory of the applicant as an SSA academic fellow as a maturing clinical or non-clinical academic researcher and teacher and their future leadership potential. The academic fellowship selection panel and the Trustees will consider the overall academic standing of the proposed host institution within the addictions field, and more generally also. the applicant’s established addictions expertise.